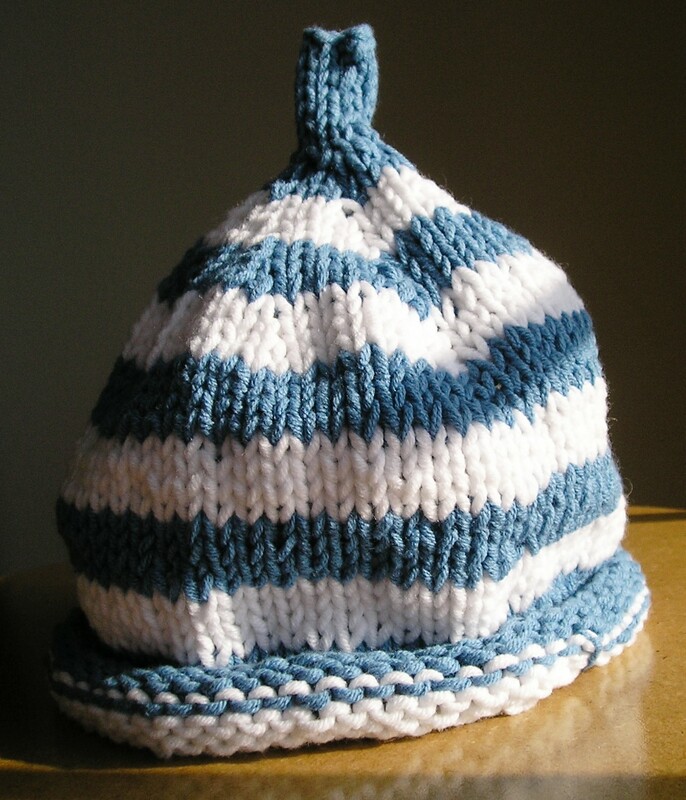 MYOKB: “Striped Baby Hat” Finished! After last week’s endless seed stitch adventure, this week’s foray into My Year of Knitting Blissfully (MYOKB) has been a piece of cake. Easy peasy, lemon squeezy, as they say. 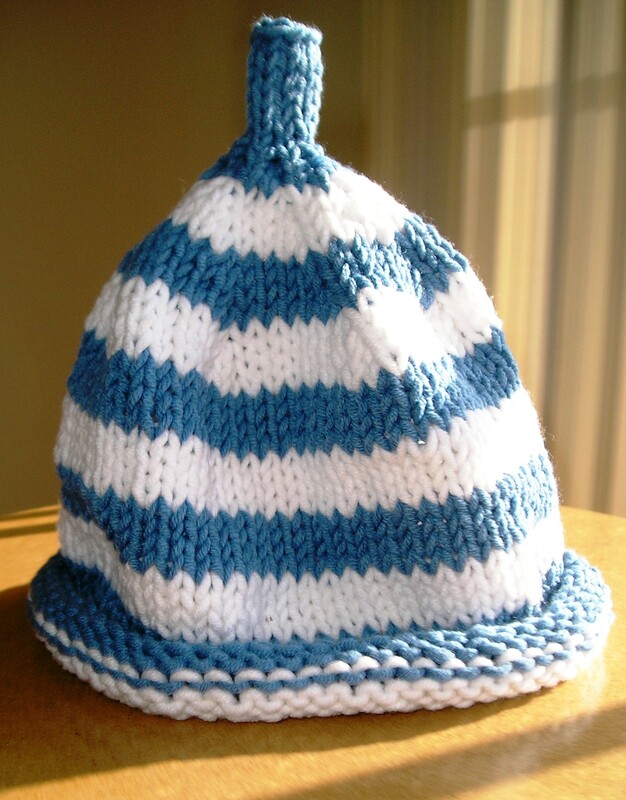 This week’s project (finished in one evening, as predicted) is the “Striped Baby Hat” on page 68, which I worked using GGH Goa in white and Suss Snuggle in a lovely shade of French blue. Although the labels describe these yarns as having slightly different fiber contents (slightly different percentages of cotton and acrylic), I strongly suspect, actually, that these two yarns are identical to each other and are just marketed under different names and brands. This is a common practice in the yarn world. Anyway, they worked together swimmingly and the gauge match was perfect. Gauge isn’t super-important with a project like this one, of course. My philosophy is that, eventually, the baby’s head will fit the hat. I’ve made many baby hats similar to this one in the past, so the only real trick I remastered was the “jogless jog,” a technique to help you avoid unsightly “hitches in your stitches” (which is waaaay better than hitches in your britches, trust me) when you work stripes in the round. Basically the technique involves knitting the first round of any new color change as usual, and then knitting the first stitch of the previous round together with the first stitch of the second round. You can see it more eloquently described by the inimitable Meg Swanson here. And you can (kind of) see the “jogless jog” in action if you look at the right side of this second picture of the “Striped Baby Hat” ; follow the seam up from the little “bump” in the bottom hem on the far right. Apologies for not taking a better picture. Previous Post MYOKB: Baby Cardigan Finished! Next Post MYOKB: “Lacy Scarf” Finished!